2005 Porsche Carrera S in Black with a Black Leather Interior. Powered by a 3.8L/355hp 6-Cylinder Engine and backed by a proper 6-Speed Manual Transmission. Original MSRP was $91,150 with numerous desired factory options consisting of a Black Full Leather interior ($3,315), Adaptive Sport Seats ($2,695), Navigation for PCM ($2,070), Bose High End Sound Package ($1,390), Sport Chrono Package Plus ($920), 19" Sport Design Wheels ($390), Rear Window Wiper ($360), and Black Mats with Porsche Lettering ($115). It also comes with an extra key, window sticker, and Porsche Certificate of Authenticity. This Carrera S has excellent curb appeal and shows in great condition throughout - much finer than the mileage might indicate. The cockpit of this Carrera maintains basic design themes from the past but boasts cleaner layouts and enhanced functionality. Remarkable craftsmanship and attention to detail throughout welcomes both driver and passenger. The firmly bolstered, leather-swathed and deeply contoured Adaptive Sport Seats in front are in fantastic condition, offering miles of driving pleasure. As would be expected from Porsche, long known for its unique sports car engineering, the Carrera S comes in with cutting-edge performance technology. Porsche fitted them with dynamic suspension technology capable of handling high-speed cornering. Engine and transmission employ the latest technology to deliver incredible acceleration while keeping fuel economy reasonable. 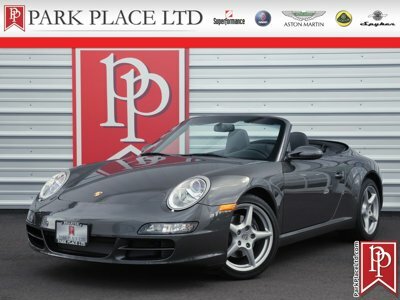 For more information on this 2005 Porsche Carrera S Coupe or any of our 40+ Porsches always in stock, contact one of our friendly and knowledgeable sales consultants or feel free to drop by our 5-acre Bellevue, WA facility - Home to the West Coast's Most Exciting Inventory of Luxury, Exotic, Sports and Collectible Cars with 200+ Always on Site.